The Telcare BGM™, the world’s first cellular-enabled, FDA-cleared glucose meter, made a positive impression on Wall Street Journal writer and reviewer Walt Mossberg. As a type 2 diabetic myself, I found the Telcare meter a refreshing change, and a significant step toward bringing consumer medical devices closer to the world of modern technology. 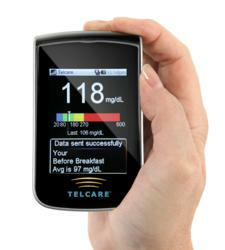 The Telcare BGM measures blood sugar in a manner similar to traditional glucose meters, meeting the FDA’s latest standards of accuracy and reliability. What sets this device apart, however, is that it transmits every glucose reading to Telcare’s FDA-cleared cloud server, from where it is relayed to physicians, other health professionals and authorized relatives of the user. Each time a test is sent, guidance and coaching is transmitted back to the user by displaying it on the screen of the Telcare BGM. Numerous articles in the medical literature have shown that this type of real-time feedback and coaching is critical to improving the outcomes of diabetes and other chronic illnesses. “I believe diabetics who use this new system will be less likely to skip readings, or to fudge the numbers, especially if they allow doctors and other caregivers to see the results instantly,” said Mossberg.